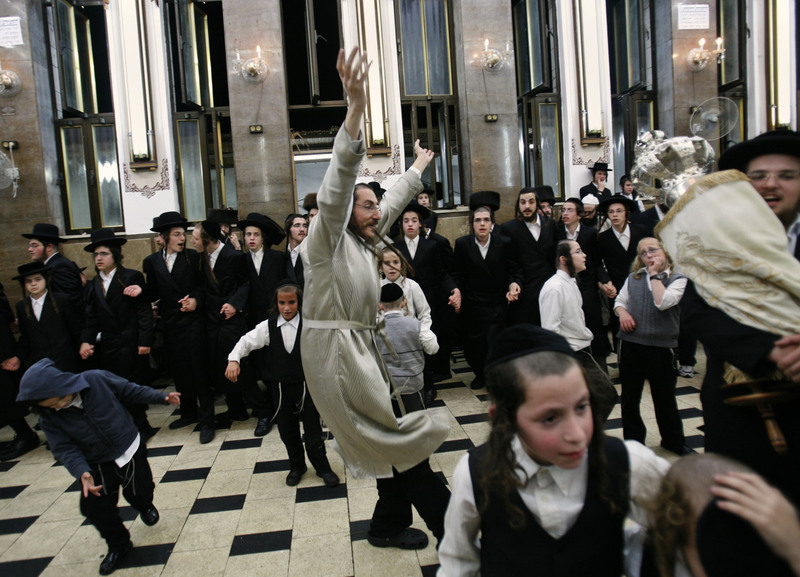 ‘Simchat Torah’ is an exuberant dance performed while holding the Torah wrapped in its mantle. The Torah wants to dance but as it has no feet; a Jew must become ‘the feet of the Torah’. “The foot is utterly nullified to the will of the brain, as we can see from the fact that a person’s thought-impulse to move his foot is instantly obeyed. A foot that does not heed the command of the brain is not healthy. Each week in synagogues around the world, a portion of the Torah is chanted. Over the course of a year, the entire Torah is recited. The final reading of this cycle occurs on Simchat Torah, a Rabbinical festival celebrating both the completion of the Torah’s reading cycle and the start of the new cycle. This entry was posted in Uncategorized and tagged circle, cycle, dance, feet-brain-connection, Jewish holiday, joy, mantle, reading, rejoice, Simchat Torah, submission, synagogues, Torah, yoke. Bookmark the permalink.